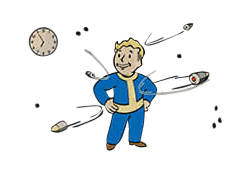 Ricochet is a Perk in Fallout 4. It is associated with the Luck Stat. Rank 1: What goes around comes around! An enemy's ranged attacks will sometimes ricochet back and instantly kill them. The closer you are to death, the higher the chance.